* If the applicant is more than 12 people per category, The qualifying will be held. Schedule from qualifying until the tournament is as follows. * We will send email when we revicve your application. * Applicant of the doubles department is required entry fee by one person. * We will send email about payment method. We will send email about payment method. * Please refer to the "Rules and Regulations" about Music / Compulsory Form / Technical Bonus Form and more. * Plese send Music / Compulsory Form / Technical Bonus Form to us. * We will send email to you about the detail. - Application documents will not be returned you sent. Also, you can not refund the entry fee. - Inquiries about the examination results will be required default procedures described JPSA Regulations. - Personal information of the person who has entry, we will use only within the following range. 2. Such as the notification of this convention participation method, various contact involved in Event Management. - If the tournament in the event that does not depend on the responsibility of the organizers was canceled, refund of entry fees and the tournament entry fee is not done at all. 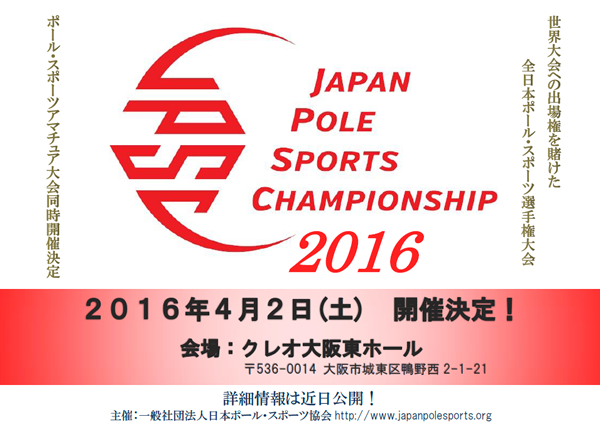 Copyright© 2013 Japan Pole Sports Association All rights reserved.